Fairfield and Suisun Transit (FAST) and Solano County Transit (SolTrans) jointly operate SolanoExpress. The service changes are designed to streamline SolanoExpress services and fares, providing consistent and convenient service to the customer systemwide. FAST operates the Blue and Green Express “GX” Lines, and SolTrans operates the Yellow, 85, and 80 Lines. The service/fare changes for the Blue and GX Lines are described below. Blue Line: Routes 20/30/40 are realigned into one service route between Sacramento and the Pleasant Hill BART station, now called the Blue Line. The service provides a focused commuter service to UC Davis and Sacramento to the east and to Benicia and Pleasant Hill to the west. A new stop is added on Vaca-Valley Parkway (serving Genentech, Kaiser, and Solano Community College), as well as a new stop on Suisun Valley Road at Kaiser Drive/Westamerica Drive. This service includes a new direct connection to the Sacramento Valley Train Station with a layover to improve on-time performance. (Note: All current Sacramento stops remain with the new service.) This service eliminates regional service to the Solano Town Center in Fairfield and Davis Street Park and Ride in Vacaville. Green Express “GX” Line – The Route 90 name is changed to the Green Express “GX” Line. Direct service continues from the Suisun City Amtrak/Fairfield Transportation Center to El Cerrito del Norte BART. New SolanoExpress Blue and Green Express Schedules may be viewed at www.fasttransit.org. Green Express “GX” Line: There is no fare change on the GX Line. See SolanoExpress Fare Structure. Blue Line: Fares are reduced. See SolanoExpress Fare Structure. Fares on the Blue Line (within Solano County) will mirror the old fares on the Route 20, Route 30 Short Hop, and Route 40 Short Hop). 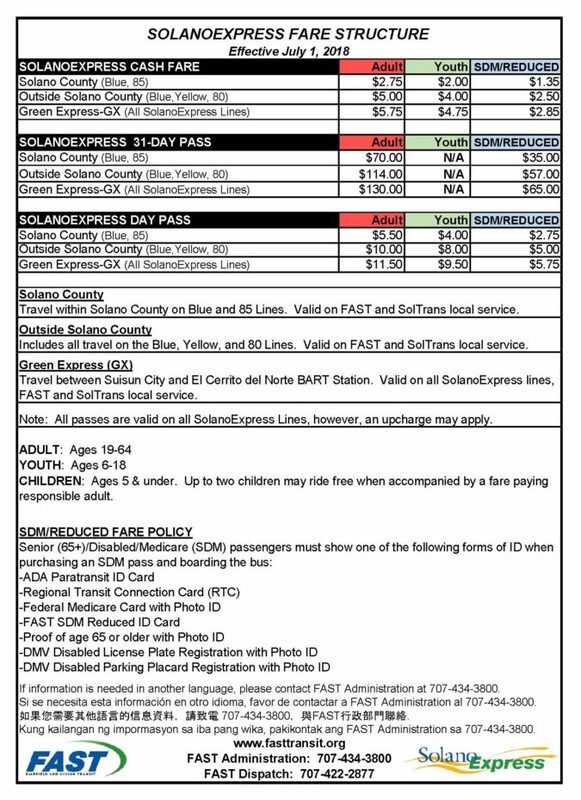 SolanoExpress 31-Day paper passes and paper Day Passes (see below for details) are valid on all SolanoExpress buses and local systems operated by FAST and SolTrans. Some trips may require additional fare. SolanoExpress Youth 31-day passes are eliminated (paper and Clipper). A new SolanoExpress Day Pass is now available and may be used systemwide. See SolanoExpress Fare Structure below for Day Pass fares. The SolanoExpress Day Pass is valid on FAST and SolTrans local routes. A SolanoExpress Day Pass may be purchased on the bus and at various sale sites. With the implementation of SolanoExpress Day Passes, paper transfers on SolanoExpress buses are eliminated. A SolanoExpress Day Pass is valid until 11:59 pm on the day it is activated. SolanoExpress Service: With the implementation of SolanoExpress Day Passes, transfers will no longer be issued on SolanoExpress buses. FAST Local Service: The Transfer Policy remains the same on FAST Local service. Transfers are valid within the FAST local system only. If travel from the FAST local system to SolanoExpress is needed, a Day Pass may be purchased to cover the transfer(s) needed. New fares will be in effect on Clipper July 1, 2018. Route 30, 40, 90 fares loaded prior to July 1, 2018, will be valid on the corresponding routes. For example a previously loaded Route 90 pass will be valid on the Green Express “GX” after July 1. Passes loaded prior to July 1, 2018, will be accepted and valid until September 30, 2018. Clipper SolanoExpress 31-Day passes will be valid only on the system for which it was purchased. For example: A Blue or Green Express (operated by FAST) 31-Day pass will not be valid on the Yellow, 80, or 85 Lines (operated by SolTrans). SolanoExpress Day Passes will not be available on Clipper. A 60-minute transfer is automatically loaded upon tapping the Clipper device. Paper transfers will no longer be issued (in the event of traffic or other agencies not accepting Clipper). All current paper passes expire June 30, 2018. FAST LOCAL SERVICE: All routes and fares remain the same. If information is needed in another language, please contact FAST Administration at 707‑434‑3800. Si se necesita esta información en otro idioma, favor de contactar a FAST Administration al 707-434-3800. Kung kailangan ng impormasyon sa iba pang wika, pakikontak ang FAST Administration sa 707-434-3800.